When you’re getting prepared for a whitening treatment at the dentist, the dental professional will take a quick look at your mouth to see if there are any pre-existing issues that need to be addressed, like obvious decay, gum disease, or even a tooth that shows signs it may need a root canal. 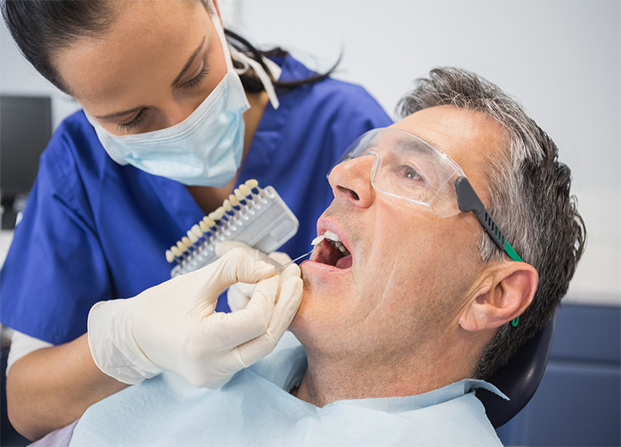 You may have come in for a strictly cosmetic treatment, but you’ll benefit from the experienced eye of a dental professional who can spot a small problems before they become big issues. Over-the-counter bleaching treatments, particularly whitening strips, often cause gum sensitivity for the user. That’s because they are one-size-fits-all products, which can overlap onto the gums. Bleaching trays provided by a dentist are fitted to the patient, so the bleach stays on the teeth, not on the gums. Professional solutions used by your dentist are typically stronger than those in over-the-counter kits, so your teeth may whiten more quickly. Pointe Dental Group offers three types of whitening for your convenience. The first is our long-term (customized) tray system. This procedure will give you the absolute maximum whitening effect. Pressed for time? We also offer an in-house whitening procedure that can be done in one visit or a short-term tray system. One of the biggest drawbacks with whitening strips and over-the-counter trays is that they’re one-size-fits-all products and may not fit perfectly on your teeth. This can result in uneven and inconsistent whitening. Custom trays from a dentist (or an in-house treatment) will ensure even distribution of the whitening gel and consistent contact with the teeth for maximum results. Remember, existing fillings, bridges, veneers, and crowns will be unaffected by any whitening treatment. Whitening your teeth may make them a different color than these other restorations. Whatever whitening method you choose, check with your dentist or dental professional to make sure it’s safe, effective, and right for your dental needs. The dental professionals at Pointe Dental Group can answer all your questions about whitening procedures. Schedule an appointment with us, or call and take the first step toward keeping your smile radiant. This entry was posted in Cosmetic Dentistry and tagged Cosmetic Dentistry, Teeth Whitening. Bookmark the permalink. Follow any comments here with the RSS feed for this post. Both comments and trackbacks are currently closed.